Looking for the perfect processor to build your gaming rig around? But you also want to edit your action videos and photos? But to do this you know you need serious performance. 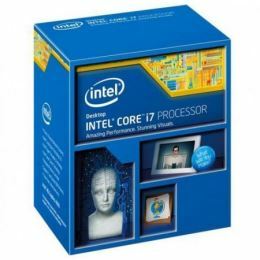 Not to worry - Intel is happy to anounce our first 4GHz base frequency quad core processor. If it is performance you crave, then this is the processor you have been waiting for. But what if you feel the neeed to overclock your system to squeeze every last bit of performance out of it? Well, then this is still the processor for you. The Latest Intel Core i5 and i7 processors, paired with the latest Intel 9 series H and Z chipsets, will get you the results you want. Add in features like built in visuals and Intel Quick Sync Video, which allows the conversion of media from one device to another and prepares your media to share online at incredible speeds, and these are processors that meet every need you have. • Intel HD Graphics - Enhanced 3D performance for immersive mainstream and casual gaming. can support up to three UltraHD (4K) displays and collage display. • Intel Wireless Display - Wirelessly stream HD / 3D video and games to your TV or projector for presentations and entertainment. • Intel Clear Video HD - Visual qulity and colour fidelity enhancements for HD playback and immersive Web browsing. • Intel InTru 3D - Stereoscopic 3D Blu-ray playback in full 1080p resolution over HDMI 1.4 and premium audio. • Intel Advanced Vector Extensions - A set of new instrutions to improve software performance for floating point-intensive applications such as audio processing, audio codecs, and image and video editing applications.